To Cite: Khashij S, Karimi B, Makhdoumi P. Phytoremediation with Festuca arundinacea: A Mini Review, Int J Health Life Sci. 2018 ; 4(2):e86625. doi: 10.5812/ijhls.86625. Nowadays the increase of population and rapid development of technology have caused concerns and environmental problems such as pollution of water, air and soil. Therefore searching to reduce the environmental impact of development by researchers and authorities seems to be essential. Among existing technologies, phytoremediation is an efficient, environmentally friendly and inexpensive method to absorb and collect pollutants in harvested tissue. In this method, pollutants are omitted from aquatic and soil ecosystems through using mechanisms such as rhizofiltration, rhizodegradation. In this regard, several plants have been investigated by researchers. One of the most important species used in the phytoremediation is Festuca arundinacea. A large number of studies investigated the usage of Festuca arundinacea in the treatment of heavy metals and organic compounds. Festuca arundinacea showed the ability to isolate heavy metals, such as lead, in contaminated environments by its airborne organs and roots. The present study offered to introduce the most important mechanisms of the plant and the potential of Festuca arundinacea for absorption and decomposition of environmental pollutants and, in particular, the purification of contaminated soils. Today, the advent of technology and industry has been threatening many humans and even environmental concerns. The present and future generations will face many problems unless an alternative is introduced. Environmental pollution, including water, soil and air, is one of the problems facing our today's society with industrialization (1). The accumulation of heavy metals in ecosystems (through absorbing into the food chain) and increasing their concentrations may bring the world into critical stages of environmental problems (2). As an example, problems to renal blood system, metabolic abnormalities and neuropsychiatric defects in children may be the result of the introduction of toxic and unnecessary lead, as a heavy metal, into human body. Inclusion of high levels of heavy metals into the bodies of pregnant women can lead to abnormalities such as the birth of premature infants and severe mental retardation in new-borns (3, 4). Heavy metals and organic compounds penetrate to the ecosystem through industrial wastewater. The accumulation of heavy metals in agricultural soils through irrigation with contaminated wastewater causes soil pollution. Among toxic heavy metals, cadmium and lead cause concern due to their durability and stability in the environment (5). The presence of heavy metals in the environment affects on the processes of physiology and plant growth. In an experiment on soil contaminated with potassium dichromate, some corn plants were cultured and, after 38 days, the plants were harvested for biochemical analysis. The results showed the increasing amount of chromium concentration, the fresh and dry weight of the root and the stem were reduced. In addition, the content of chlorophyll (a and b), total chlorophyll and carotenoids significantly decreased. The presence of heavy metals has been known as one of the most important environmental stresses, which can lead to a decrease in the growth and production of various reactive oxygen species. Available technologies to remove of the metals from contaminated soils, such as transferring to the laboratory, washing soil with chemicals, and finally replacing the soil in the original location, are known to be very expensive and cause soil degradation. Technologies such as adding lime, phosphate and calcium carbonate are also proposed for heavy metal leaching. These methods include advantages, such as rapid reduction in the risk of contaminants, however, they are temporarily used since heavy metals are not removed from the soil environment. The high costs of existing technologies have led to search for new removal strategies, with low cost and low environmental impacts. Among the existing technologies, phytoremediation is considered as a major solution due to its unique advantages over other methods. These benefits include ease of usage, efficiency, affordability, and wide usage. Box 1 shows the main advantages and disadvantages of the phytoremediation. Another benefit of this environment-friendly and environmentally-friendly approach is that it requires no special equipment and specialist and its user convenience. 3. Using non-native plants in this method may disrupt the ecosystem of the area (1). An important strategy for success in the technology of phytoremediation is a selection of plant species in order to achieve optimal compatibility with the environment and specific pollutants. For example, due to rapid growth and high biomass, Helianthus annus is a plant that is always considered as an appropriate herb for this method and extraction of toxic metals from contaminated soils. Naderi et al. conducted experiments to evaluate the efficiency of six cultivars of Helianthus annus including Alstar, Hessian 33, Syrna, Sanra, record and iroflorur in the extraction of lead herbs from contaminated soils (2). The results showed that there was a significant difference between the translocation factor and the total lead extracted among the shoot of different spices of Helianthus annus at a probability level of 0.01, that is, with a probability of 99% more lead transferred from the root to the organ (2). In another study, Shariat et al. conducted a comprehensive research on the fast-growing and evergreen species of Eucalyptus (E. occidentalis) in the presence of cadmium (3). The results showed the increasing amount of cadmium and praline in addition to decreasing amount of the plant pigments. They also reported that Eucalyptus has an ability to accumulate cadmium without serious disruption in the growth (3). According to studies, those plants that have been used in Phytoremediation technology are as following: Atriplex lentiformis, annual seedlings of Acer velutinum, Brassica napus, Lathyrus sativus, Carthamus tinctorius, Robinia pseudoacacia, German Matricaria chamomilla, Rhus coriaria, Allium sativum, Silybum marianum herb, Avicennia marina, Lavendula officinalis and Lavendula officinalis. Brassica nigra, Sorghum bicolor Moench and Avena sativa have been identified as suitable plants for this technique due to their high biomass (4). In agricultural areas infected with heavy metals, the choice of tolerant crops to remove pollutants from the soil can be a new strategy for land management (5). On a structural and functional perspective, aquariums play a very important role in aquatic ecosystems through water regimes, creating shelter for fish and aquatic invertebrates, creating a food source and improving water quality via balancing oxygen, food cycles, and biosynthesis of heavy metals. The ability of aquariums to absorb heavy metals, especially for treatment of industrial wastewater, has been widely noted. However, due to the compatibility of this technology as well as low cost, it has attracted many scholars (6). The inherent ability in adaptation to the environment and climate conditions plays an influential role in phytoremediation. One of the most important species used in the phytoremediation is Festuca arundinacea. A large number of studies investigated the use of Festuca arundinacea in the treatment of heavy metals and organic compounds. Festuca arundinacea showed the ability of heavy metals isolation, such as lead, in contaminated environments with its airborne organs and roots. Festuca arundinacea were indicated in the absorption and decomposition of environmental pollutants and purification of contaminated soils, particularly. Festuca arundinacea is a permanent herb, often dense hemp, up to 180 cm high, with masocharum stem, straight, tight, simple, not cracked, linear leafy, and tipped (Figure 1). It mainly grows on the margins of gardens, agricultural lands, valleys, canals, and sometimes grassland, mostly in the north and west of Iran, in the vegetative regions of Iran, Turanian and Caspian. It is well positioned in acidic soils with pH equal to 4.8 up to alkaline soils with a pH of 9.5; however it shows the best growth in neutral soils. Festuca arundinacea shows a long period of growth, at the beginning of the vegetative growth from late March to early April, early flowering until mid-June, seeding in July, and then the summer recession, at which the plant is almost green. In the presence of moisture during this period, it also grows and in the autumn, depending on the temperature of the environment, its growth is relatively long, sometimes for 2 to 3 months (7). Festuca arundinacea grows in all soils except for sandy, dry and coarse tissues; however, it has shown the best growth in deep wet soils with a heavy to moderate texture and rich organic matter. It tolerates soils with poor drainage especially in the winter. Due to the fact that this plant is mostly seen on the margins of the fields in Iran, the arena is mainly sloping and sometimes in slopes of mountainous. It is seen to be widely grown in elevation range of 50 to 2400 meters and has the highest dispersion in elevation heights of 50 to 1950 meters (7). Balasubramaniyam et al. examined the growth of Festuca arundinacea in naphthalene contaminated sand (8). The concentration of naphthalene required per kg of sand was measured. The seeds of Festuca arundinacea were placed in the center of the pot filled with sand. Cultivation was carried out in clean sand and then contaminated with naphthalene. At first, the growth of F. arundinacea was inhibited in naphthalene-infested sand, but after 2.5 months, the rate of growth in naphthalene contaminated sand was higher than the control plant, and there was a significant difference between root dry weights. Albornoz et al. examined the amount of lead and zinc collected from contaminated soils in present of two species of Festuca arundinacea and Cynodon dactylon (9). They collected samples of soils from different industrial areas and placed seed of plants. In the industrial soil, lead value was higher compared to the control soil and zinc concentration in the industrial soil and control soil showed similar situation in which zinc values were significantly higher than the control. The levels of lead and zinc in the root of Cynodon dactylon in the contaminated soil were higher than the control soil. There were higher levels of lead and zinc in the grass root in contaminated soils, compared to the lead and zinc concentrations in control samples that were 551% and 258%, respectively. As mentioned in this section and with review on literatures, Festuca arundinacea has been widely used for metal separation and hydrocarbonous degradation from polluted soils and sites. These researches were conducted in field and greenhouse scales. Most studies have been taken by greenhouses scale due to more controlling conditions and stresses. For example, Chen et al. used a greenhouse growth chamber for degradation of pyrene in the rhizosphere of tall fescue (Festuca arundinacea) and switchgrass (Panicum virgatum L.) (Figure 2). They reported that during the 190 days of incubation, 37.7 and 30.4% of pyrene (14C-pyrene) was mineralized in the soil planted with tall fescue and switchgrass, respectively (10). Figure 2. Greenhouse growth chamber (10) charcoal (A, F, J, K, S, W); flow meter (B, C, L, N); water condenser (D, Q); XAD-2 (E, R); NaOH (G, H, T, U); empty vial (I, V); irrigation port (M); leachate collection (N); tensiometer (O); growth light (X); and vacuum pump (Y). As seen in Table 1, the wide ranges of heavy metal have been accumulated in Festuca organs. Among various studies most of them showed that the Festuca can separate Zn, Cd and Pb, successfully. Due to its tolerant and strong roots, Festuca arundinacea can absorb more lead compared to other herbaceous plants. Because of its adhesion properties, lead is more concentrated in the root, i.e. the bioconcentration factor for lead accumulation in the root of the plant is higher than the translocation factor (9). The ability of Festuca arundinacea to compete with other types of plants for phytoremediation is more closely related to the roots of this plant. The analytical results of the root culture of Festuca arundinacea and their role in the treatment plant showed that fatty acids are more effective in phytoremediation process of root and these fatty acids stimulate more bacteria. In addition, the amount of fatty acid was increased in the pots to remove oil. The findings provided mechanisms that enabled the increases in oil degradation by Festuca arundinacea. Lou et al. reported a study in which the germination and physiological response of Festuca arundinacea and its growth under lead and cadmium stresses were examined (11). At low Cadmuim concentrations, germination rate of plants was high and the activity of catalase and peroxidase were also high, but the transport and protein contents decreased under the stress of lead. Festuca arundinacea absorbs lead in the form of Pb2+ in the root. Lead is absorbed on the exchange surfaces and precipitated by soil anions. The amount of this absorption depends on the type of clay minerals, clay content and soil organic matter. The Pb2+ in the soil solution is transmitted to the plant's root by diffusion processes and mass flow. Also, it is slightly absorbed by the plant through contact absorption and quickly deposited in the form of lead phosphate at the root surface, tissues, wooden beds and drainage. Phytostabilization of lead in wooden beds and root tissues results in a delay of lead transformation to the shoots and leaves (12). In Soleimani et al. study, two species of Festuca arundinacea and Cynodon dactylon were used for phytoremediation of nickel and lead contaminated soils. The results showed that the amount of nickel and lead in the root of Festuca arundinacea was significantly higher than other plants (14). 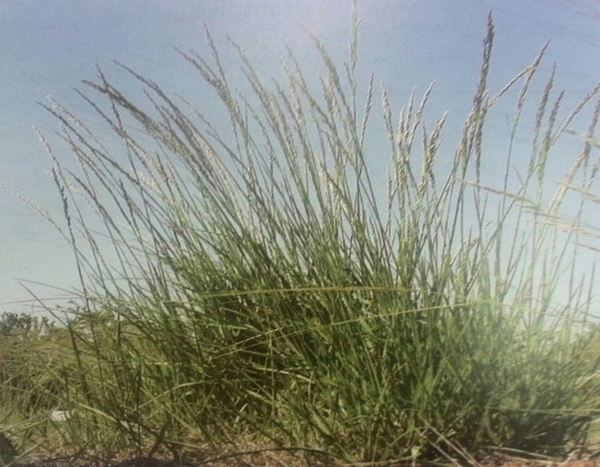 Festuca arundinacea is a species that is more likely to be used for phytoremediation, however more research is required to determine the range of species and their usage and application related to the various pollutants (23). By comparison between two plants Medicago sativa and Festuca arundinacea, Sun et al. saw that the Festuca arundinacea had a higher ability to absorb PAHs in the soil than Medicago sativa, so the researchers concluded that the Festuca arundinacea may be a promising biologic strategy for phytoremediation (24). In another study two species of Festuca arundinacea and Dactylis glomerata were used for phytoremediation of terbuthylazine-infused soils. It was found that tall Festuca (Festuca arundinacea) was stronger to eliminate terbothylazine. Festuca arundinacea has been found to be more sensitive to glutathione and ascorbate due to its effect on glucose and glucose content of glaciolone. This phenomenon is the result of a negative TBA effect on Dactylis glomerata (25). Soleimani et al. (14), applied two species of Festuca arundinacea and Festuca pratensis for oily soil phytoremediation, and they observed that the roots of these two species and their stems could store a higher level of water-soluble phenol (12). As shown in Table 2, there are many studies of Festuca arundinacea application for degradation of aromatic hydrocarbons. Thus, it is clear that the roots of plant play an important role in biodegradation. The degradation time is different between one week to several month depend on environmental condition and the type of hydrocarbons for example three-rings or four rings (26, 27). It is confirmed that the environmental stress can effect on phytoremediation behavior of plant, for example, the effect of polycyclic hydrocarbons on zinc phytoremediation was investigated by using two species of Brassica juncea and Festuca arundinacea and it was observed that zinc was more concentrated in the root of Festuca arundinacea, whereas there was a high concentration of zinc in the stem of Brassica juncea. This result showed that the phytoremediation mechanisms are not same for each plant and the type of pollutants. Furthermore, some other agents such as bioavailability and soil properties may be effective (28). Two main applied mechanisms by Festuca arundinacea for heavy metal accumulation and hydrocarbons degradation are; (i) rhizofiltration, and (ii), rhizodegradation, respectively. These mechanisms are used by the plant roots to separate heavy metals from a medium like water. Rhizofiltration is considered as an effective and emerging environmental cleanup technology. This mechanism effectively can be used to remove the toxic heavy metals such as Cu2+, Cd2+, CP, Ni2+, Pb2+, and Zn2+ from aqueous solutions (33). In this mechanism the adsorption/precipitation of metals onto plant roots or surrounding of the root zone is occurred. When the plant roots become saturated with pollutant, they are harvested. Rhizodegradation is also can be nominated as phytostimulation and refers to the breakdown of contaminants into the plant roots, or rhizosphere (area of soil surrounding the roots of the plants). This phenomenon is known to be carried out by bacteria or other microorganisms whose numbers typically flourish in the rhizosphere. Pseudomonas spp. (butanovora, aeruginosa, fluorescens etc.) is the most common genus that found in roots plants and rhizodegradation mechanism (33). Although it has been around 10 years since the initial application of phytoremediation in the world, this science has developed rapidly and today the plant is used for organic, inorganic and radioactive materials. This is a rather cheap process that developing countries find it very convenient and economical. The optimization of the process of absorbing heavy metals by the plant and produced biomass has been investigated yet, so that the experimental results are consistent with reality and practice. Today, most of the laboratory-scale phytoremediation is carried out in hydroponic conditions and heavy metals are given, while the soil environment is completely different. In real soil, many metals are insoluble and their accessibility is low, which considered as a major problem. Since the many plants have not been identified yet, it is necessary to investigate them and their physiology. In this regard, today's world can be inspired by the nature and its indestructible system to improve the damage induced by humans, which is certainly easier than preventing the pollution of resources, especially soil. Phytoremediation is a promising technology to clean up heavy metals from water and soils. Although the purification plant is still not fully understood, a larger number of researches are required to discover new plant species and their ability to heavy metals accumulation, in purpose to rebuild the mechanism and penetration of microorganisms along with the improvement of the process of phytoremediation. North and west of Iran has been known as natural habitat of Festuca arundinacea which has shown to be influential to purify soils contaminated with heavy metals, since these plants absorbs the highest amount of lead in contaminated soils. In this regard, bioconcentration factors in the root of Festuca arundinacea have got to be higher than the translocation factor, which leads to higher concentration of lead in the root. The small amount of lead also transfers to upper organs of Festuca arundinacea, because lead is adhesive but in most cases it remains in root. 1. Henry JR. An overview of the phytoremediation of lead and mercury. Washington, DC: National Network of Environmental Management Studies (NNEMS), Prepared for US Environmental Protection Agency; 2000. 2. Naderi MR, Danesh-Shahraki A, Raiesi F. [Evaluation the efficiency of six sunflower cultivars in phytoextraction of lead from a Pb-bearing soil for long term]. J Soil Water. 2014;28(3):596-604. Persian. 3. Shariat A, Assareh MH, Ghamari-Zare A. [Effects of cadmium on some physiological characteristics of Eucalyptus occidentalis]. J Sci Technol Agricult Natur Resource. 2010;14(53 (B)):145-54. Persian. 4. Nascimento CWA, Xing B. [Phytoextraction: A review on enhanced metal availability and plant accumulation]. Scientia Agricola. 2006;63(3):299-311. Portuguese. doi: 10.1590/s0103-90162006000300014. 5. Mauskar JM. Cadmium–An environment toxicant. Delhi, India: Central Pollution Control Board (Ministry of Environment & Forests, Govt of India), Parivesh Bhawan, East Arjun Nagar; 2007. 6. Roomiani L, Hakimi Mofrad R, Jalili S. [The phytoremediation study of aquatic plants of Dez river (Potamogeton crispus, Polygonum hydropiper, Ceratophyllum demersum and Phragmites australis), for the bioaccumulation of cadmium, lead, zinc and copper heavy metals]. Wetland Ecobiol. 2015;7(23):29-35. Persian. 7. Moghimi J. [Introduction of some important species suitable for development and improvement of Iranian rangelands]. Tehran: Aron; 2005. Persian. 8. Balasubramaniyam A, Chapman MM, Harvey PJ. Responses of tall fescue (Festuca arundinacea) to growth in naphthalene-contaminated sand: Xenobiotic stress versus water stress. Environ Sci Pollut Res Int. 2015;22(10):7495-507. doi: 10.1007/s11356-015-4084-8. [PubMed: 25874421]. 9. Albornoz CB, Larsen K, Landa R, Quiroga MA, Najle R, Marcovecchio J. Lead and zinc determinations in Festuca arundinacea and Cynodon dactylon collected from contaminated soils in Tandil (Buenos Aires Province, Argentina). Environ Earth Sci. 2016;75(9):742. doi: 10.1007/s12665-016-5513-9. 10. Chen YC, Banks MK, Schwab AP. Pyrene degradation in the rhizosphere of tall fescue (Festuca arundinacea) and switchgrass (Panicum virgatum L.). Environ Sci Technol. 2003;37(24):5778-82. doi: 10.1021/es030400x. [PubMed: 14717195]. 11. Lou Y, Zhao P, Wang D, Amombo E, Sun X, Wang H, et al. Germination, physiological responses and gene expression of tall Fescue (Festuca arundinacea Schreb.) growing under Pb and Cd. PLoS One. 2017;12(1). e0169495. doi: 10.1371/journal.pone.0169495. [PubMed: 28046098]. [PubMed Central: PMC5207687]. 12. Homaei M, Ghafarian Mogharab MH. [Investigation of the relationship between different forms of lead in soil with radish absorption (Rhaphanus sativa)]. The 10th Iranian Soil Science Congress. Karaj. 2007. p. 1535-4. Persian. 13. Cao A, Cappai G, Carucci A, Muntoni A. Selection of plants for zinc and lead phytoremediation. J Environ Sci Health A Tox Hazard Subst Environ Eng. 2004;39(4):1011-24. doi: 10.1081/ESE-120028410. [PubMed: 15137716]. 14. Soleimani M, Afyuni M, Hajabbasi MA, Nourbakhsh F, Sabzalian MR, Christensen JH. Phytoremediation of an aged petroleum contaminated soil using endophyte infected and non-infected grasses. Chemosphere. 2010;81(9):1084-90. doi: 10.1016/j.chemosphere.2010.09.034. [PubMed: 20961596]. 15. Begonia MT, Begonia GB, Ighoavodha M, Gilliard D. Lead accumulation by tall fescue (Festuca arundinacea Schreb.) grown on a lead-contaminated soil. Int J Environ Res Public Health. 2005;2(2):228-33. doi: 10.3390/ijerph2005020005. [PubMed: 16705822]. [PubMed Central: PMC3810625]. 16. Zhu D, Schwab AP, Banks MK. Heavy metal leaching from mine tailings as affected by plants. J Environ Qual. 1999;28(6):1727-32. doi: 10.2134/jeq1999.00472425002800060006x. 17. Feierhan H, Li-ying P, Yong C, Nazila Z, Tao W. Impact of Pb in automobile tail gas on soil pollution. Arid Environ Monitor. 2002;3:10. 18. Li DM, Zhang XJ, Li GH, Deng DF, Zou H. Effects of heavy metal ions on germination and physiological activity of festuca arundinacea seed. Pratacult Sci. 2008;6:27. 19. Taylor RW, Ibeabuchi IO, Sistani KR, Shuford JW. Heavy metal concentration in forage grasses and extractability from some acid mine spoils. Water Air Soil Pollut. 1993;68(3-4):363-72. doi: 10.1007/BF00478463. 20. Zhao S, Jia L, Duo L. The use of a biodegradable chelator for enhanced phytoextraction of heavy metals by Festuca arundinacea from municipal solid waste compost and associated heavy metal leaching. Bioresour Technol. 2013;129:249-55. doi: 10.1016/j.biortech.2012.11.075. [PubMed: 23247507]. 21. Hetrick BA, Wilson GW, Figge DA. The influence of mycorrhizal symbiosis and fertilizer amendments on establishment of vegetation in heavy metal mine spoil. Environ Pollut. 1994;86(2):171-9. doi: 10.1016/0269-7491(94)90188-0. [PubMed: 15091634]. 22. Shetty KG, Hetrick BA, Figge DA, Schwab AP. Effects of mycorrhizae and other soil microbes on revegetation of heavy metal contaminated mine spoil. Environ Pollut. 1994;86(2):181-8. doi: 10.1016/0269-7491(94)90189-9. [PubMed: 15091635]. 23. Batty LC, Anslow M. Effect of a polycyclic aromatic hydrocarbon on the phytoremediation of zinc by two plant species (Brassica juncea and Festuca arundinacea). Int J Phytoremediation. 2008;10(3):234-49. doi: 10.1080/15226510801997549. [PubMed: 18710098]. 24. Sun M, Fu D, Teng Y, Shen Y, Luo Y, Li Z, et al. In situ phytoremediation of PAH-contaminated soil by intercropping alfalfa (Medicago sativa L.) with tall fescue (Festuca arundinacea Schreb.) and associated soil microbial activity. J Soil Sediment. 2011;11(6):980-9. doi: 10.1007/s11368-011-0382-z. 25. Buono DD, Pannacci E, Bartucca ML, Nasini L, Proietti P, Tei F. Use of two grasses for the phytoremediation of aqueous solutions polluted with terbuthylazine. Int J Phytoremediation. 2016;18(9):885-91. doi: 10.1080/15226514.2016.1156633. [PubMed: 26934386]. 26. Pilon-Smits E. Phytoremediation. Annu Rev Plant Biol. 2005;56:15-39. doi: 10.1146/annurev.arplant.56.032604.144214. [PubMed: 15862088]. 27. Huang JW, Chen J, Berti WR, Cunningham SD. Phytoremediation of lead-contaminated soils: Role of synthetic chelates in lead phytoextraction. Environ Sci Technol. 1997;31(3):800-5. doi: 10.1021/es9604828. 28. Cunningham SD, Ow DW. Promises and prospects of phytoremediation. Plant Physiol. 1996;110(3):715-9. doi: 10.1104/pp.110.3.715. [PubMed: 12226213]. [PubMed Central: PMC157769]. 29. Reilley KA, Banks MK, Schwab AP. Dissipation of polycyclic aromatic hydrocarbons in the rhizosphere. J Environ Qual. 1996;25(2):212-9. doi: 10.2134/jeq1996.252212x. 30. Ho CH, Applegate B, Banks MK. Impact of microbial/plant interactions on the transformation of polycyclic aromatic hydrocarbons in rhizosphere of Festuca arundinacea. Int J Phytoremediation. 2007;9(2):107-14. doi: 10.1080/15226510701232765. [PubMed: 18246719]. 31. Cheema SA, Khan MI, Tang X, Zhang C, Shen C, Malik Z, et al. Enhancement of phenanthrene and pyrene degradation in rhizosphere of tall fescue (Festuca arundinacea). J Hazard Mater. 2009;166(2-3):1226-31. doi: 10.1016/j.jhazmat.2008.12.027. [PubMed: 19150175]. 32. Kuiper I, Bloemberg GV, Lugtenberg BJ. Selection of a plant-bacterium pair as a novel tool for rhizostimulation of polycyclic aromatic hydrocarbon-degrading bacteria. Mol Plant Microbe Interact. 2001;14(10):1197-205. doi: 10.1094/MPMI.2001.14.10.1197. [PubMed: 11605959]. 33. Etim EE. Phytoremediation and its mechanisms: A review. Int J Environ Bioenergy. 2012;2(3):120-36.